The Eagle’s Nest - Welcome to the quiet and peaceful heart of Northern Idaho. Rest and Relaxation - If you are in need of a place to rest and relax and enjoy God’s beauty you’ve come to the right place. Nestled atop the rim of the Kootenai River in the heart of mountainous northern Idaho you will find the private and peaceful Eagle’s Nest. Whether you choose to spend the morning relaxing in the luxurious bath, enjoying the spectacular view, spotting bald eagles, or you choose to relax on the deck with a good book, a cup of coffee, and the buzz of hummingbirds, you are guaranteed to soak up relaxation during your stay. Adventure - The Eagle’s Nest is the right spot for you if adventure is the name of your game! Coordinate your day’s activities from the comfort of the Nest. Choose from; golfing, fishing, hunting, canoeing, skiing, biking, hiking, walking, scenic drives, and more. Just minutes away from golfing in Bonners Ferry. If you get up early enough the local moose will likely be joining you in your morning endeavors and eying your hole in one! If gambling is more of your game, then you are minutes away from a night at the Casino. And, if you are the rugged outdoor type and enjoy hunting and fishing you’ve definitely come to the right place. With many lakes to choose from for great trout and bass fishing. And with miles of mountainous regions offering elk, deer, moose, bear, turkey, and even cougar hunting you are sure to find your adventure highlights during this year’s vacation at the Nest! Work it Remotely - True confessions, you know you are out there, and the Nest is built just for you. You know it's your vacation, but you just have to check in with work, get your e-mail, or get your Internet fix. Well have no fear, the Eagle’s Nest offers high speed wireless Internet access – for free! Just bring your own laptop and hook yourself up and they’ll never know you are on vacation in the heart of the mountains. Accommodations - The Eagle’s Nest sleeps four to six people comfortably. One Master bedroom suite with Queen size log bed and private full bathroom with master bath and separate shower. One Guest bedroom with Double size log bed and private full bathroom. A Great Room with Queen size pullout sofa bed and access to your own small bathroom with toilet and shower off of the kitchen. Large open kitchen with granite counter tops and double islands with many cooking supplies. Large dining area with table and chairs for sitting six comfortably. Large deck and relaxing backyard with barbecue. Flat screen TV. Dish Network. Phone. Wireless High Speed Internet. Two car garage. Priced Just Right - Reasonably priced at $155 per night with an additional VRBO processing fee for online booking. Phone charges will be billed separately after your stay. Linens and towels are included. Housekeeping services are not available. The Eagle’s Nest is Non-Smoking with No Pets. Welcome to Northern Idaho! The Eagle's Nest was formally owned by my parents and was their retirement home for over ten years. You will find a meditation bench on the Kootenai Rim in the backyard of the Eagle’s Nest and this is where they sat together and decide that this was indeed the best location to build their retirement home. Come and enjoy peace and beauty nestled atop the rim of the Kootenai River. The number one reason is the spectacular view! Enjoying rest and relaxation amongst the wildlife of northern Idaho! Outside Fire Pit for Marshmellow Roasts! We thoroughly enjoyed our stay! Beautiful home in a beautiful location! Wonderful renter and property manger! Highly recommended! Great location. Accomadations were spectacular! 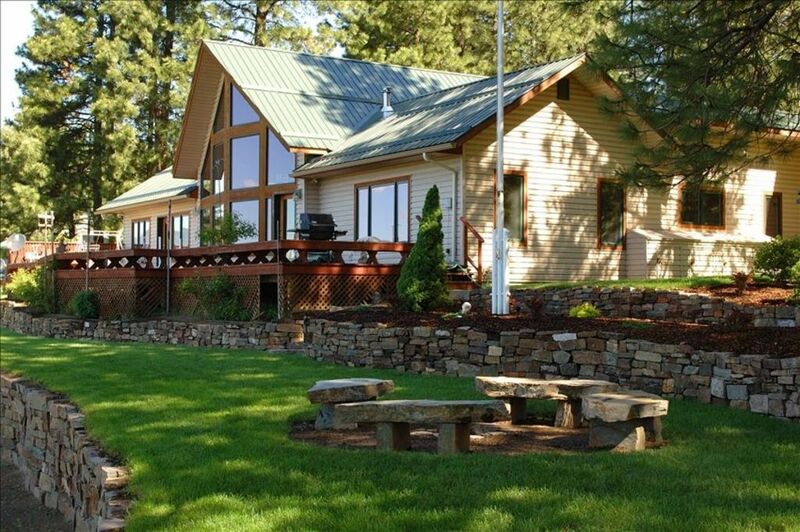 Id recomend this property to anyone who is looking for a relaxing get away in the north idaho area! Great place for winter stays as well - spectacular views, plus heated garage! Such a wonder place! The views of the Kootenay River are spectacular. We spent the Christmas holiday here and cooked our Christmas dinner here as well. The kitchen had everything we needed. We spent a day at nearby Schweitzer Mountain resort. It was great coming back to a heated garage to park our car. Thank You Anne and Dennis. We’ll be back! We spent roughly a week at the Eagles Nest from Oct. 12-18. The home was very well stocked with the small amenities that make an extended stay pleasing. There were plenty of towels, blankets, and pillows for our family of four. Although the weather did get a little chilly in the evening, the days were beautiful and we spent most of the days out hiking and sightseeing. If I had one wish for our stay, it may have been some kind of retractable blinds for the large windows. The view was beautiful, but at the right time of day the main living area was very bright and the sun warmed up the room to the point that we did open the doors to cool it down...by no means a deal breaker, just a point to mention. Dennis, the property manager, checked in with us to make sure we had everything that we needed and our entire stay went off without a hitch. Thanks. Rates are subject to change until your reservation is confirmed by the owner via your signed rental agreement.